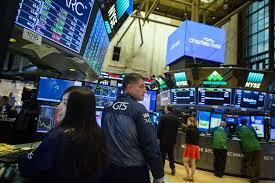 U.S. stocks continued to march toward records as the latest batch of corporate earnings and data from China boosted optimism in the global economy. Bonds fell and the dollar edged lower. The S&P 500 pushed to a fresh six-month high, while the Nasdaq 100 topped its intraday record. Morgan Stanley and PepsiCo. Inc. rose after posting solid results, while CSX Corp. and Kansas City Southern lifted transportation stocks. Netflix Inc. advanced even after a weak subscriber forecast. IBM Corp. dragged the Dow Jones Industrial Average lower after sales slumped. In corporate news, Qualcomm Inc. headed for the highest since 2014 after settling with Apple over royalties. Sprint Corp. slumped on reports its merger with T-Mobile US Inc. was said to be in doubt. Data overnight showing China’s economic growth, industrial production and retail sales all topped estimates boosted equities around the world. The Stoxx Europe 600 Index erased a drop, while shares rose in Japan and Shanghai. The yield on 10-year Treasuries climbed to a four-week high and the dollar stayed lower after the U.S. trade gap unexpectedly narrowed. European debt also dropped, while the euro strengthened even as Germany’s economy ministry revised its growth forecast lower. Elsewhere, oil climbed after data showed a surprise drop in crude inventories. The New Zealand dollar retreated after inflation slowed more than forecast, while the Australian dollar rose after the Chinese data.